This program is designed specifically to assist insurance industry sales and service professionals to adjust and benefit by the dramatic changes and market fluctuations that are characteristic of an industry in transition. High-Payoff Selling for Producers offers specific, hands-on strategies, resources, and blueprints for accelerating sales, client retention rates, profitability, and efficiency. Additionally, it provides detailed planning tools for personal and professional development. The implementation of the Program's principles, techniques and tools is reinforced over time by a staff of professional insurance industry coaches who will work closely with each program participant. This coaching element is what allows the training to be put into practice, and results in changed behaviors and improved results. Whether the economy is in turmoil, prolonged and irrational market conditions exist, and client buying motives focus on price, we can complain and be victimized by these conditions or we can do something with them. Against this back drop, High-Payoff Selling for Producers provides agencies with all of the marketing, communications, sales, service and agency management tools and tactics necessary to identify and harvest emerging opportunities for sustainable profitability and growth – regardless of external market conditions. One of the greatest challenges we face is how to educate clients that have grown accustomed to buying on price to understand and appreciate the value, integrity, and unique characteristics of a comprehensive insurance program and to recognize the truly professional agents that present them. Our program is designed to remedy this problem. High-Payoff Selling for Producers guides each participant down a path of self discovery and performance improvement. It generally begins with a complete assessment of an agency’s business model, people, and practices. This strategic fitness assessment process evaluates your market position, agency brand, marketing and communications initiatives, agency culture, carrier relationships, service standards and practices, value proposition and strategies for attracting, selling, and retaining desirable accounts. Our common objective is to create an efficient and effective integrated marketing, sales and service model that is as unique as your agency. A model that is designed to take maximum advantage of your strengths and points of differentiation, accurately identify and harvest your opportunities, minimize or eliminate your organizational weaknesses, and neutralize threats to your growth and prosperity. Throughout the assessment process, the agency will be challenged to cast aside traditional, “legacy” presumptions, historical performance benchmarks, and antiquated marketing, selling and service styles. Your program will be designed to upgrade and/or replace “business as usual” behavior with an innovative relationship-driven client development and service strategy that promotes value delivery, integrity and partnership. Novel as this approach seems, the material in the program and our method for designing yours is based on years of functional, hands-on field experience. The difference in today’s insurance market is the speed under which the transformation must take place and the significant consequences that are inevitable for those that can’t or won’t change. In short, the High-Payoff Selling strategy is no longer just the right thing to do; it is the required thing to do. High-Payoff Selling for Producers is not another “how to” program about the process of selling and servicing “products.” There are already too many marketing gimmicks and training programs available that offer a variety of impractical selling methods and service gimmicks. None of them effectively weigh-in with any remedies for the real-life, day-to-day struggles of the professionals within the insurance industry. Compared to such programs, High-Payoff Selling for Producers is a radical departure. It is a “hands-on” process that is designed to bring both topics (methods and motivation) together in the context of the down-to-earth reality experienced by the average producer, account executive, agency principal, and customer service representative. It is an insider’s guide for survival and achievement within an industry that is rapidly redefining itself. The advantages of our program also transcend the ranks of producers and service providers. Although the course has been designed primarily for those directly involved with marketing, selling and servicing insurance programs; experience with in-person and online coaching & training has proven that exposing the entire organization to these concepts has sparked some surprising results. Most non-service and non-sales people find the material quite easy to adapt to their situations and almost all of them undergo a positive transformation. 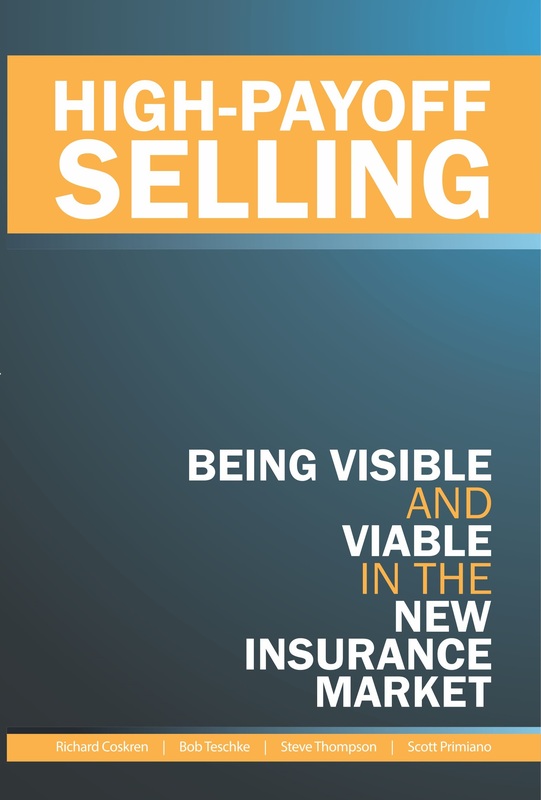 High-Payoff Selling for Producers is written specifically to address the dramatic and potentially advantageous changes that are developing in the insurance industry. An industry with big issues that has been ignored by training and consulting companies due to the level of expertise required to build and sell credible solutions. This is not an academic program nor is it conceptual or generic. It is a hands-on, practical, viable, and proven program for personal and professional achievement within the industry. It’s a program on a mission. It is written from “the trenches” and not from the drawing board. No other program that we are aware of delivers a strategy that is as effective, humanistic, or reality-based as the approach outlined in High-Payoff Selling for Producers. In the corporate consulting space there are countless examples of generalized marketing, sales and service programs that are content rich, intellectually compelling, and ineffective. They tend to drift into organizations, linger briefly, and drift forgetfully away. Our real world, no-nonsense, activity-focused program sets the stage for lasting achievement. This simple fact is what makes all of our programs so credible and so popular. The impact will be extraordinary. Participants will develop and consistently implement an efficient and effective new business development strategy that attracts, analyzes, educates, and embraces only truly qualified opportunities. Production will improve by a minimum of 20%. Participants will customize and implement a proactive, value-driven, client management plan that provides a consistent level of client contact and ensures that a visible and viable partnership is maintained with each key account. Retention will dramatically improve. Participants will create a priority management planning system that will define, organize, and prioritize high-payoff, business building activities. As a result, participants will work smarter, live better, and receive a far greater return on their invested time and attention. Participants will learn how to integrate practical, hands-on, efficient and effective education initiatives that enable personal lines, group benefits, small commercial, and middle-market clients to proactively manage their insurance programs. Clients will learn to manage their insurance costs the right way—by minimizing the frequency and severity of their claims, and improving their risk management programs. This is just the beginning. The mentoring, alumni programs, active marketing, and follow-up coaching components of our program enable us to support and train each participant long after the formal training has ended. This complimentary service ensures accountability to the fundamentals of High-Payoff Selling for Producers while providing a springboard for each participant to continue their personal and professional development.